Cinema is a spiritual sanctuary. It can be a place of healing, a place where you can hear the validating voice of a personal and very present God. Jesus Loves Movies provides you with 30 films that will draw you into a cinematic experience with the most creative director. Use this audiobook as a devotional, a guide, or in any way that you desire. May it show you that God is in everything. May it lighten your load and demonstrate to you that he is fun, interesting, and deep. May it open your senses to a side of God that the modern day church sometimes struggles to understand. 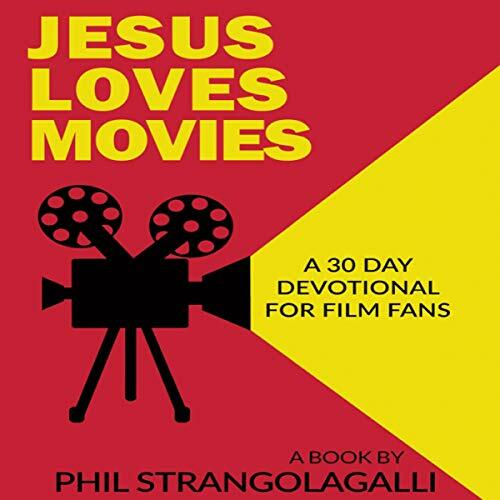 Written during a season of deep pain, grief, and injustice, analyses of the 30 films contained in Jesus Loves Movies will bring you to a secret movie space. A space where the most Holy One will adorn you with his peace, love, and restoration. This is Phil Strangolagalli’s first book, and it was never planned. Phil is recently married to his beautiful wife, Kathryn (the real Wonder Woman), and they don’t live far from the Daily Bugle. In Phil’s spare time you can find him taking long walks in the movie theater, teaching his wife about the complexity of film, and talking to strangers. Phil is excited for how this book will reveal to you a side of Jesus that he believes people must know - an intimate, fun, actually very real God. This is a great reminder that the love of God can be found anywhere! God loves us and will use whatever he can to help us understand that truth. It was so fun to hear truths of Gods word found in movies I love. Thanks Phil! This book has such deep meaning, I have listened to it many times. It helps me understand God in a new way. I can relate. Understanding God is difficult and I find the stories of the Bible dated because I do not understand the concepts of the time period. This book brings relatable stories to life and applies it to the word of God and life’s struggles, and pain, and helps me understand and connect with God in ways I have not before.